Pre powder coat seam sealer 15000 is a unique and technologically advanced adhesive, developed to aid the paint and powder coat industry. CTA 15000 fills gaps and seal seams in metal panels prior to being put through an oven bake cycle. This enables metal fabricators to spot weld stainless steel panels and then fill the gaps, thereby reducing welding time and speeding up production and process time overall. When cured in the oven, this product becomes very strong and paintable. Pre powder coat seam sealer 15000 is often used by paint and powder coat companies when preparing aluminium panels, in industries such as automotive, construction and manufacturing. Car and bus panels can be bonded together with our adhesive quicker than traditional methods. Stainless steel stiffeners can confidently be bonded to panels prior to paint cycles within the cladding and commercial facade industries. When you need to fill a gap or seal a joint between two metal parts, then this high-viscosity (paste-like) adhesive is ideal. For more information on our pre powder coat seam sealer 15000, view our heat curing adhesive page. Pre powder coat seam sealer 15000 adhesive is a one-part product and has been specifically formulated with a unique blend of adhesives similar to epoxy resins. Curing and the development of adhesion are not achieved until the material is heated above 130°C. This newly developed formulation cures more quickly at temperatures as low as 90°C. At these temperatures, the adhesives will generally cure in about an hour. Higher temperatures will result in a faster cure. Limitations on cure speed are generally dependent on the temperatures that the unit and components are able to withstand. Heat curing can be done in a batch or conveyor oven. Heat cured adhesives will cure in either thin or thick section and can cure when confined. Pre powder coat seam sealer 15000 cures in 30 mins at 130°C. Before dispensing, ensure that surfaces are clean, dry and free of any dirt, dust and grease. For the best results, we recommend using CTA IPA Cleaner Degreaser. Pre powder coat seam sealer 15000 is available in black, in quantities of 310ml. The viscosity of this product is a paste and the hardness is +80. If a larger volume is required, we are able to supply bulk units. Trial kits are also available for this product or you can purchase directly from the store here: Pre powder coat seam sealer 15002. Our UV identifiable primer for adhesives is an adhesion promoter for hard to bond substrates. When highlighted with an ultraviolet light, the exact location of the applied primer can be seen. This aids in accurate application of an adhesive or tape. This UV identifiable primer can be used on surfaces such as polyethylene, polypropylene, ABS, PET/PBT blends, concrete, wood, glass, metal and painted metal surfaces. Apply a thin, uniform coating to the bonding surface with a brush or a swab, using the minimum amount that will fully coat the surface. This primer can also be applied with a pressurised flow gun, roller or other similar type of application equipment. Allow the primer to dry thoroughly before applying the tape or adhesive. This is usually accomplished in five minutes at room temperature. Ensure the primed surface remains free from contaminants prior to applying the tape or adhesive. Not that porous surfaces may require two applications of primer for a uniform coverage and good adhesion. Make sure that the first coat is dry before the second coat is applied. See also our regular primer for adhesives. 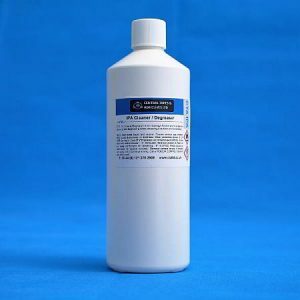 After using the primer for adhesives, we also recommend using a micro lint free cloth with our IPA Cleaner degreaser to prepare a surface before bonding. This ensures that the surface is completely clean and free from dust, dirt and grease. Our UV identifiable primer for adhesives is available to purchase bottles of 236.5ml. A UV identifiable primer is also available. For other variations and quantities, please contact us. All prices are inclusive of VAT. If you have any questions, do not hesitate to contact us via the yellow chatbox, fill out our online contact form, email us at [email protected], or call us directly on +44 (0) 121 378 2909. Fusionbond 377 is the strongest structural adhesive ever made! A two component methacrylate adhesive. Specially formulated for structural bonding of thermoplastics, metal, wood and composite assemblies. New Fusionbond 377 is an excellent choice for composite bonding applications in the marine, automotive and construction industries because it requires virtually no surface preparation. 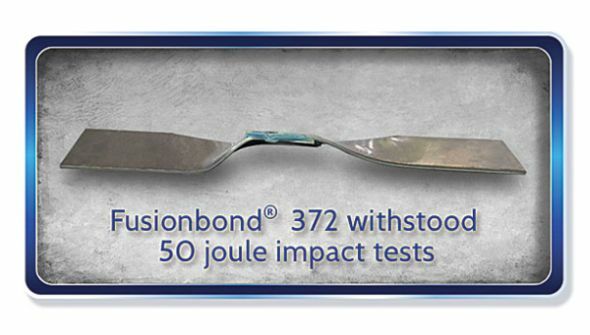 Fusionbond 377 provides superior toughness at temperatures from -40° to 120°C (250°F). The open time of Fusionbond 377 is 3 to 5 minutes with a fixture time of 8 to 10 minutes. 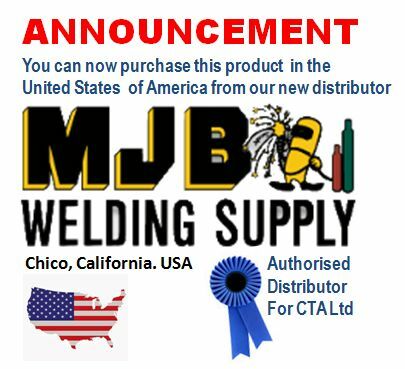 We are the UK & European technical specialists and distributors for Hernon Manufacturing, Inc. 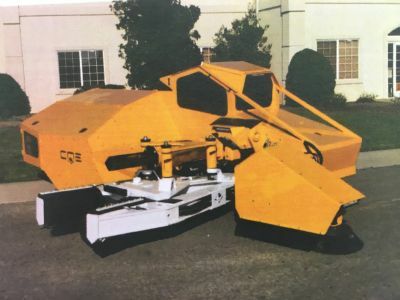 In 2010 a US manufacturer of tree shakers and bulk handling equipment, COE Orchard Equipment, made the switch from paint to powder. Benefits include increased durability, higher coating efficiency and reduced cost. COE manufacture and ship equipment world wide to meet harvesting needs for crops such as almonds, walnuts, pistachios, pecans and olives along with stone fruit such as peaches, prunes and cherries. 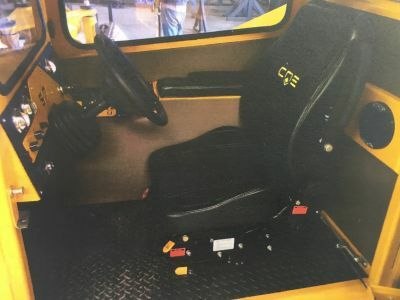 Since going from paint to powder, COE have increased their efficiency as a manufacturer, working to reduce labour and improve processes which have allowed them to meet rising demands for their products. One of the largest growing products is the S7 shaker (for almonds and walnuts). The S7 “cab” requires over 12,700mm (500″) of weld, a large amount is sealing weld to maintain sanitation in the cab. After looking at other solutions like silicone and mastic sealants which are not suitable, a search then lead COE to Central Tapes & Adhesives Ltd and our innovative and technologically advanced product, CTA 15002 pre powder coat seam sealer. After a brief testing period with CTA 15002, COE quickly realised its potential to be a viable solution. 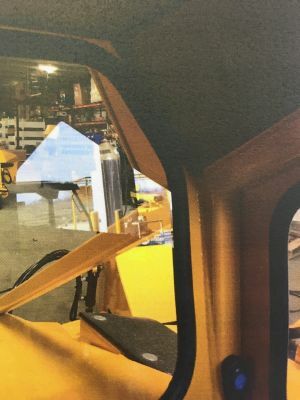 Our heat curing adhesive allowed the customer to reduce the total amount of weld in the cab from 12,700mm (500″) to 6,096mm (240 “). 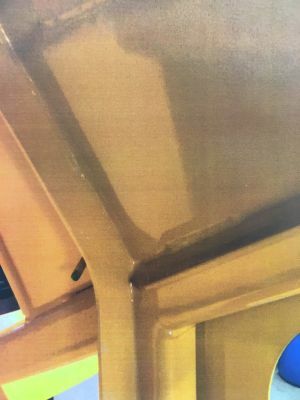 The 6,096mm is required for the structural strength of the cab and the remainder of the seam is now sealed with CTA 15002 pre powder coat seam sealer. With the welding process halved, it has saved a considerable amount of labour costs. COE are extremely pleased with the new process, given its cost saving and improved production and process time. As a premium product manufacturer, COE Orchard Shakers want to achieve the best finish possible. 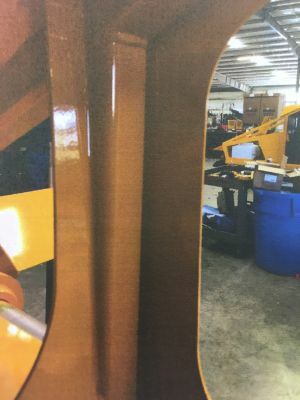 Whilst pre-heating the cab frame and components in order to expunge oil and contaminates, it was also an opportunity to apply, cure the sealant and apply the powder coat simultaneously. Due to its convenient packaging in a handy 310ml cartridge it can be quickly and easily applied in minutes with no additional steps required and only one pass through the oven has been a great advantage to COE. Pictured to the right is an example of a 3.175mm (1/8″ ) gap between the firewall and the main frame of the S7. The sealant covers the gap and holds its position in the oven ie. it is paste-like and non-sagging and creates a hard, durable and lasting seal. In some cases COE say they have even used our product as a body filler over panel flaws. Shown below is a before and after shot of the top right hand corner of the cab. You can see, COE have used CTA 15002 adhesive sealant. In this application, the main frame is 4.77mm (.188″ ) to 25.4mm (1″ ) thick mild steel. Therefore, in order to cure the thickest part, means parts such as the cab are in the oven for 25-30 minutes longer than needed for powder cure. CTA 15002 does not discolour or deform from being in the oven longer than necessary, thus allowing more flexibility in use. The next image is an area where the sealant will not be covered by insulation or by trim. Due to the high quality finish and the ability to retain the finish, COE have no hesitation in leaving these parts exposed. Had this been previous silicone or mastic they would have eventually discoloured, looked unprofessional or simply disintegrated in the oven. In the images below, you can see the completed cab. With the use of the sealant and cab pressurisation it allows for the cab to be a clean location in a dusty work environment. COE pride themselves in manufacturing equipment that meets the needs of the grower, techs and operators. 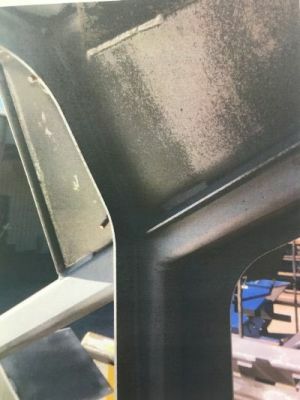 We hope you have enjoyed reading this case study on the use of our 15002 pre powder coat seam sealer. We are pleased to print the testimonial below, showing that COE recommends CTA 15002 to other manufacturers with similar needs. To find out more about any of our products contact us now 0r chat directly with an advisor below! Motorsport adhesives have progressed significantly over the years and with the ever-evolving, fast paced motorsport industry, adhesives have had to step up. We pride ourselves on supplying quality products that are right for your application and backed up with knowledge and experience in your industry. The motorsport industry has always been ahead of the game in advanced technology, motivated by the desire to decrease weight and increase component strength. F1, rally and touring cars have taken the advantage of using lighter and stiffer materials for decades. 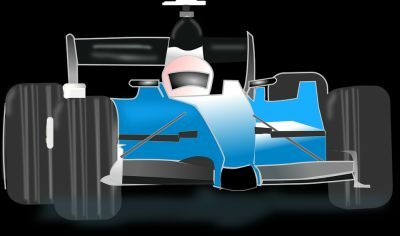 Carbon, and hybrid constructions are used in components throughout the vehicle from the chassis to exhausts. It is therefore imperative to find a manufacturer and supplier who can supply advanced adhesives to equal this advanced motorsport technology. Central Tapes & Adhesives have a great range of adhesives, sealants and tapes to support the automotive industry and a growing number of products have been used in the motorsport sector. Methacrylate adhesive, Polyurethane (PU), Epoxy and Hybrid technology are increasingly used, not only in production but for repair on race day of carbon fibre panels. Our adhesives have proven to be a quick and effective way to reduce pit time. CTA 2105, CTA 25-5 and CTA 2605 for the fabrication and repair of carbon fibre and fibre glass moulded panels, bonding metal brackets to carbon fibre sections, bonding dissimilar metals for heavy transport, bonding fasteners to carbon fibre or order FRP laminates, GRP assembly, bond spoilers together (upper and lower mouldings). Seal windows, door and light units as well as body panels or body kits. 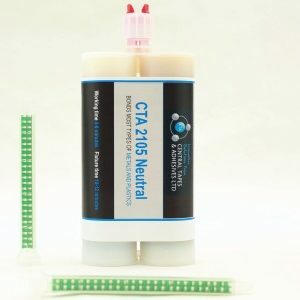 CTA 2105 two part structural acrylic Methacrylate adhesive – Ultimate bond, use when a very high structural strength is required, quick setting and easy to use. CTA 25-5 two part reinforced structural composite PU adhesive – Similar strength to the above. However, use 25-5 when low/no odour is a priority. 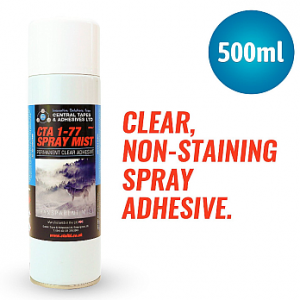 CTA 2605 two part toughened epoxy resin – When a clear strong bond is required. CTA 12126 single part high grab PU adhesive – A good all round adhesive sealant. CTA 1227 high strength thread locker green – For nuts and bolts. We have a large portfolio of products available, this is just a snap shot, if you don’t see a product you believe will assist you then please contact us, we have the products to solve most bonding challenges. You can chat to us right now below! 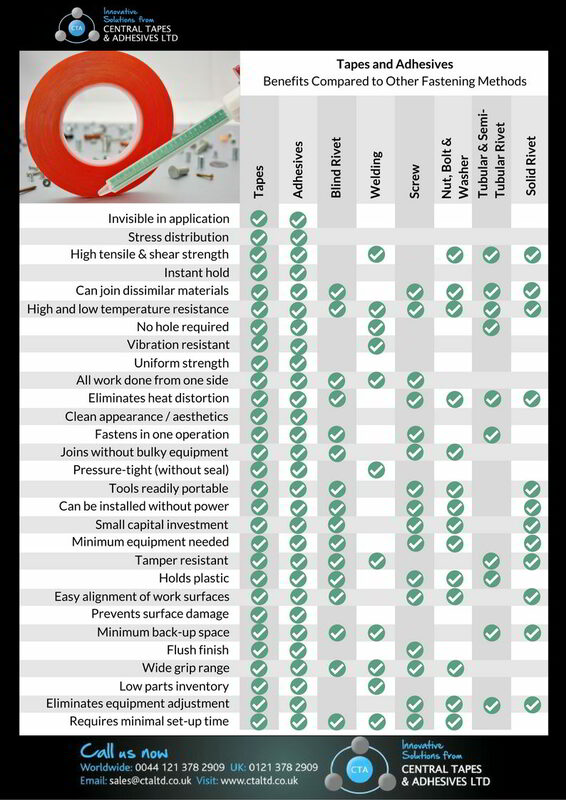 Adhesive vs welding and mechanical fixing… a thought happening much more frequently in today’s modern manufacturing times. Which would you choose for your application? What do you currently use in the work place, is it the right way? How can you be sure that a structural adhesive will be strong enough to replace welding or mechanical fixing? Thousands of industries are choosing high performance structural acrylic adhesives and replacing standard joining methods such as welding and mechanical fasteners such as rivets or bolts and we agree with them. All the answers are pointing to structural adhesive as the best way to go, read on for more information and helpful insights. Structural adhesives are cost effective and will help cut manufacturing costs by reducing the number of mechanical fasteners, spot welds and filler metal required to create a joint or attach two substrates. Adhesive joint design. 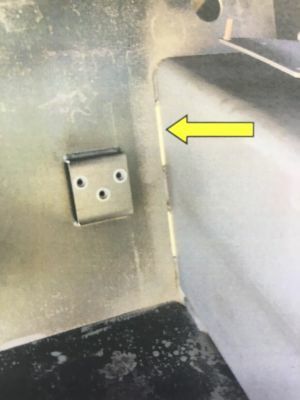 In the manufacturing process, adhesives are generally hidden between two substrates, which can offer aesthetic improvements over welding and mechanical fasteners. An adhesive bonded joint will result in a smooth, clean surface, which requires minimal surface preparation prior to final finishing. Therefore, manufacturers can eliminate labour intensive finishing costs such as sanding off imperfections from spot welding. A huge superiority to advanced product design is that adhesives can be pre applied to parts otherwise inaccessible to mechanical fastening or welding during the assembly process. This revelation enables engineers not to be bound in their innovation of design by previous obstacles such as space or accessibility. An additional benefit is the reduction in the amount of time it takes to join substrates. Welding or installing mechanical fasteners is generally more time consuming compared to using a structural adhesive. Structural adhesives excel in joining dissimilar substrates and materials with different thicknesses. Adhesive compensates for the differences in expansion and contraction in dissimilar materials. High performance structural adhesives can form resilient bonds and maintain strength over a wide range of temperatures. Adhesives have the ability to eliminate stress concentration caused by spot welds, rivers, screws, and other mechanical fasteners while maintaining surface integrity. Where as a rivet or screw hole in a substrate concentrates the stress at the hole, which can potentially decrease the physical properties of the substrate, adhesives spread the load over the entire bonded area. Visit adhesive stress loads. Using structural adhesives can reduce the weight of finished product or structure because less welding metals and mechanical fasteners are used. Additionally, eliminating screw holes and rivets in the assembly process enables manufacturers to utilise thinner, lighter materials without concerns of distortion, splitting, or crazing at the mechanically fastened site. An added benefit of eliminating the holes in metal is that it can also reduce the chance of rust and corrosion. Unlike welding, structural adhesives have the ability to maintain the integrity of the bonded materials because there is no metal distortion or weakening due to heat when using adhesives. Structural adhesives can also increase the stiffness of structures and provide the necessary fatigue and force resistance. Who is choosing structural adhesive? The answer is “everyone”. New applications are being developed and tested daily. Reports from the agricultural industry show workers are repairing metal fences using structural adhesives instead of welding. Marine industry manufacturers are bonding parts using structural adhesives in applications that require high resistance to chemicals like kerosene, hydrocarbon oil, mineral spirits, and ethylene glycol. The automotive industry is moving away from rivets in favour of structural adhesives due to a combination of corrosion resistance, stress relief and cost reduction. Aerospace engineers were among the earliest industries to adopt structural adhesives, mainly because adhesives can create seals that keep water out of metal fabrications while providing corrosion protection. If you have an application and would like to discuss further with our technical team or would like a site visit or demonstration please contact us. We have a fantastic range of high performance structural adhesives specifically for product assembly application. Fast setting epoxy clear adhesive 2605 is a toughened epoxy resin and part of our structural bonding range. Capable of bonding metals, engineered plastics and composites together. Combined with high temperature resistance, tensile and shear performance. This type of toughened epoxy is a great alternative to the common branded epoxy resins, adhesives or glues. CTA 2605 has a 5 minute working life with a 12 minute fixture time and available in standard 50ml, 400ml and also bulk sizes along with accessories. 2605 is also available in a uniquely packaged 25ml syringe. The benefits to using a 25ml syringe are easy application as no applicator gun is required. Simply detach the end cap and use hand to hold and dispense the correct amount of adhesive. This can be mixed manually or if required, attach a mixing nozzle to syringe for a more accurate application. 2605 is often specified when bonding a variety of surfaces i.e. metals, plastics and glass in a wide variety of industries from engineering assembly such as attaching golf club head, shafts and weights or even jewellery making. View our other two part epoxy adhesives such as 2620, 2650 & 2605 other sizes or for more information contact us, speak with our technical team. NOTE: To use this adhesive you will need a nozzle and an application gun. Types of adhesives and adhesive terminology is a guide to assist you in understanding the types of adhesives available to assist in determining the type of adhesive or glue you need for your application. Also, key words used in the business and what they mean. Our technical team are on hand to assist in your application so feel free to contact us. See also our structural adhesives page. HEAT-CURED ADHESIVES – Any adhesives which must be heated to promote curing. HOLDING ADHESIVES – Holding adhesives are used to hold surfaces together, but not permanently. They do not have to withstand a great deal of force. Adhesive tape is a good example of a holding adhesive. HOT MELT ADHESIVES – Hot Melt adhesives are applied in the molten state and then harden. The adhesive substance is melted, applied to the surface, then the parts are joined. Once the adhesive cools and solidifies, the joint is complete. 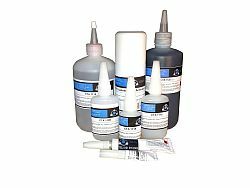 INSTANT ADHESIVES – Any adhesive which cures within seconds to minutes, usually cyanoacrylates. LOCKING ADHESIVES – Locking adhesives or sealants are used to prevent the loosening of threaded parts. Locking adhesives are placed on the threads of a bolt to prevent is from becoming loose from vibration. Thread lockers and retainers. PRESSURE SENSITIVE ADHESIVES – Pressure sensitive adhesives form bonds easily when pressure is applied. Pressure sensitive adhesives are used on double-sided tape. The joint is aided with pressure. RETAINING ADHESIVES – Retaining adhesives are used to prevent the twisting or sliding of non threaded parts. retaining adhesives are very similar to locking adhesives except they are used on non-threaded parts. SEALING ADHESIVES – Sealing adhesives are used to prevent the passage of air, water, oil, etc. between two surfaces. The caulking around windows is an example of a sealing adhesive. 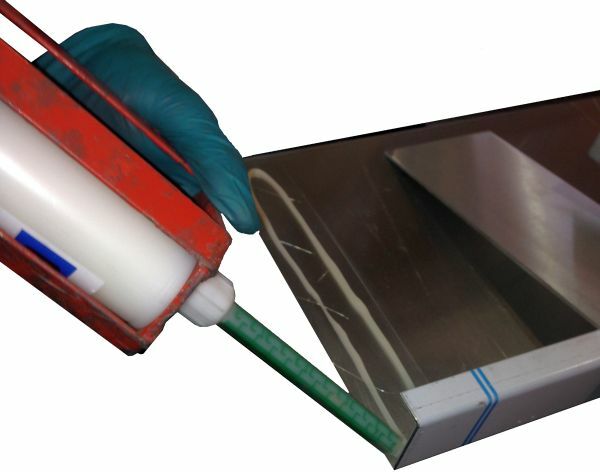 STRUCTURAL ADHESIVES – Structural adhesives are capable of withstanding a significant load. The term ‘significant load’ has never been defined, but the implication is that the adhesive must be able to withstand a great deal of stress. In fact, it cold be said that in the absence of unnaturally high forces, the substrates could be considered to be permanently joined. see also structural adhesives in more detail with links to our products. ULTRAVIOLET ADHESIVES – Any adhesives which cure when exposed to UV light. An ADHEREND is a solid material in the adhesive joint other than the adhesive (sometimes referred to as substrate). ADHESION is the process by which two surfaces are held together by inter facial forces (surface attraction) or mechanical interlocking. An ADHESIVE is a substance which is capable of holding materials together in a useful fashion by means of surface attraction. Surface attraction results from placing a thin layer of adhesive between two objects. The BOND LINE is the space or gap between two substrates which contains the adhesive. COHESIVE FAILURE is a failure mode where the failure is within the body of the adhesive, i.e. when adhesive is seen on both substrates in the same location. COMPOSITE is a general term for an assembly of dissimilar materials used together to give greater strength than the individual components would on their own, or the same strength or lighter. GRP (glass reinforced plastic) is an example of a modern day composite where resin and fibres are mixed together to give superior strength performance. CURE When an adhesive cures, it is converted from a liquid to a solid state. This may be accomplished by cooling, loss of solvents or internal chemical reaction. Curing generally implied some type of physical or chemical change in the adhesive, while hardening or melting is reversible. FIXTURE TIME is the interval of time between mixing a two part adhesive and the time a bonded assembly can be removed from the mould without distortion. RHEOLOGY is the ability of a material to flow and deform. Adhesives with good rheology flow easily and break cleanly at the end of a bead. STIFFNESS is a materials ability to resist deformation when a load is applied. STRAIN is the elastic deformation resulting from stress. STRESS is he internal resistance to change in shape and size. A SUBSTRATE is a material, which is held by an adhesive. Substrate is a generic term for objects that are being bonded. SUBSTRATE FAILURE is a failure where the substrate fails itself before the adhesive bond. TENSION is the stress resulting from pulling a material apart. A THERMOPLASTIC is a material that will soften when exposed to heat and can be reworked or re shaped before hardening when cooled. A THERMOSET is a material that solidifies when cured by mixing and/or heating and, once cured, cannot be remelted or remoulded. TOUGHNESS is a measure of a materials ability to absorb energy. VISCOSITY is the resistance to flow or degree of thickening of a fluid. WORKING TIME is the time between mixing the two components and when the adhesive becomes no longer usable i.e. skins over and will not ‘wet out’. WETTING is the intimate contact of a liquid and a surface. Good wetting is only possible if there is good attraction between the surface and the liquid. Proper wetting of a mating surface is essential for good bonding. Structural or performance adhesives are load-bearing adhesives. That is they add strength to the products being bonded. Structural Adhesives are used to build products as varied as office furniture, boats, trains, cars to name a few. There are approximately ten adhesive families commonly referred to as structural adhesives: Methacrylate, Acrylic, Polyurethane, Epoxy, Anaerobic, Cyanoacrylate, Hot Melt, Solvent cement and Tapes. Acrylic adhesives have formulations that tolerate dirtier and less prepared surfaces generally associated with metals. they challenge epoxies in shear strength, and offer flexible bonds with good peel and impact resistance. Acrylics are two-part adhesives, the resin is applied to one surface and an accelerator or primer to the other. The two parts can be pre-applied and later mated. Once mated, handling strength is typically achieved in a few minutes. Curing can be completed at room temperature. Newer versions of acrylics are now available in two component formulations then are mixed together prior to application. To discuss our acrylic adhesives please contact our technical team. Advantages – Moderately priced, good gap fill, excellent impact resistance and flexibility, excellent peel and sheer strengths, substrate versatility, medium/fast cure, tolerant of dirty surfaces, good flexibility at low temperatures. Limitations – Some odour problems, flammable. Advantages – Usually low priced, good gap filling capabilities, high strength can be filled with metals, wide range of formulations, versatile, good temperature and solvent resistance. Limitations – Adhesives thin during curing cycles, two component mixing and measuring required, exact proportions needed for optimal strength, single component usually required refrigeration and heat cure. Advantages – Moderately priced, high strength on some substrates, rapid cure at room temperature, good solvent and temperature resistance, versatile, range of viscosities, non toxic, no mixing required, dispenses easily from package, easily automated. 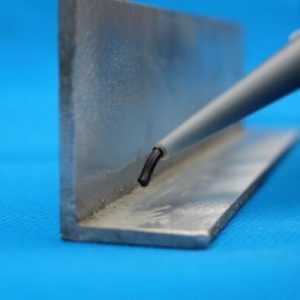 Limitations – Limited gap cure, not recommended for many plastic or rubber substrates, will not cure where air contacts adhesive – wet fillets, primers required for many materials, 150-200°C temperature limitations, generally brittle. Advantages – Rapid cure at room temperature, single component adhesive, excellent adhesion to rubber, good adhesion to metal, high tensile strength, no mixing required, indefinite pot life, dispense easily from package. Limitations – Limited gap cure, low solvent resistance, low temperature resistance, bonds skin, poor impact and peel resistance, no water chemical or environmental resistance. Hot Melt Adhesives have moved out of their traditional applications into areas of low-stress product assemblies. They form flexible and rigid bonds, achieve 80% of their bond strength within seconds, bond permeable and impermeable materials, and usually require no elaborate surface preparation. Hot Melts are insensitive to moisture and many solvents, but they soften at high temperatures. To discuss our hot melt adhesive please contact our technical team. Advantages – Moderately priced, good gap-filling capabilities, rigid to flexible bonds available, versatile formulations, fast setting. Limitations – Usually low strength, poor wetting, poor creep resistance, usually low solvent resistance, low heat resistance – degrade as heat rises, stringy, parts must be mated before adhesive cools, short part life, messy can burn workers, requires special dispensing equipment, difficult to automate. 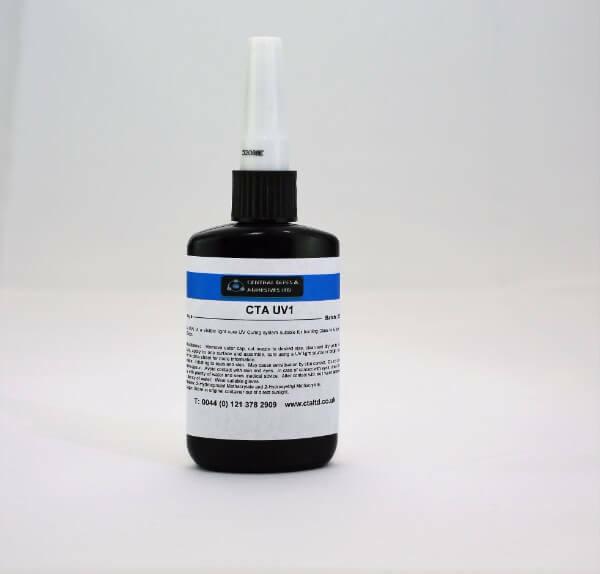 Heat curing adhesive sealant CTA 15002 is a one component adhesive. It is similar to an Epoxy system for bonding and sealing metal panels. Featuring very fast cure along with high shear strength properties. It has been specifically formulated with a unique blend of adhesives similar to epoxy resins. • Single component system; no mixing required. • Working life “unlimited” at room temperature; minimum cure temperature of 130°C. • Easy application; contact pressure only required during heat cure; adhesive spreads evenly and smoothly. • Excellent adhesion to many substrates and superior physical properties. 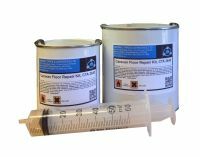 CTA 15002 Heat cured adhesive is a one-part products. Curing and the development of adhesion are not achieved until the material is heated above 130°C. This Newly developed formulation cures more quickly at temperatures as low as 90°C. At these temperatures, the adhesives will generally cure in about an hour. Higher temperatures will result in a faster cure. Limitations on cure speed are generally dependent on the temperatures that the unit and components are able to withstand. Heat curing can be done in a batch or conveyor oven. Heat cured adhesives will cure in either thin or thick section and can cure when confined. If you have problems with poor heat curing adhesive, contact CTA’s technical experts. for more information view our Pre powder coat seam sealer 15002 or contact our technical team.